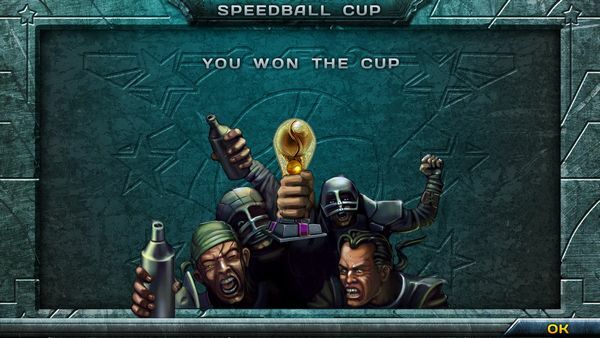 Speedball 2 HD is as fun and as balanced as it was when the original was released, and if you ever enjoyed that you’ll likely still enjoy it. But the remake adds too little – the main addition being the higher resolution graphics which are a sadly mixed blessing. And the lack of any online mode stands out by its absence. This review has to be made in two parts, separated by 23 years. Speedball 2 was originally released for the Atari ST in 1990; and it was awesome. The graphics, the sound, the feel of the game all shone and have left fond memories for many players right until the present day. 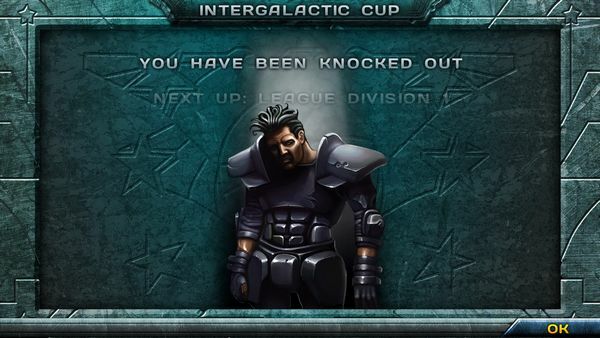 The core gameplay is left intact with Speedball 2 HD, released last week. Two teams of nine players face each other in a steel arena, playing a sport that combines handball with Rollerball‘s disregard for human life. Scoring is more than just getting the ball past the goal-keeper; while that is worth 10 points, so is knocking another player unconscious. There are also bonus bumpers on the pitch (worth two points when hit) and sets of stars (worth two points each)… and if those don’t feel enough, you can have active multipliers. Naturally, the opposing team can do the same, leading to efforts to undo their bonuses while keeping control of the game. In the two 90 second halves played, a lot can happen. The underlying game was magnificent in 1990… but 23 years have passed, and we also have to look at the HD remake in terms of what has changed. The answer is “little”. The game can be controlled with either the keyboard or a joypad; trying it with both, I did have more success with the keyboard – the game doesn’t support analogue movement anyway. Only one control button is needed, with a press tackling when you don’t have the ball, or a quick tap passing low (or shooting at goal) and a longer press throwing the ball high… default controls are WASD or the cursor keys, although reconfiguring them to the old, old gaming standard of QAOP and spacebar felt the most natural. Another reason to not hurry in plugging in that pad is that, while the menus can be navigated by pad, on some screens – specifically the gym where you can train various stats between matches – the highlighted option seems to disappear, leaving you clicking things at random. Using the mouse solves this problem entirely though. Graphically, the game can be played in resolutions up to the usual highs of 1920×1080 (or 1200 if not playing in widescreen); and this is a mixed blessing. Seeing everything is sharp focus is great… but it also emphasises that graphically, the remake has essentially just redrawn the original. 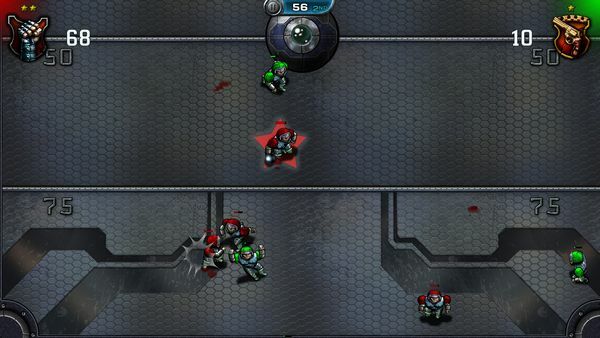 Players all look identical – no variety in armour except team colouring, no personal features, no variation in ethnicity; and there are very, very, very few frames of animation. 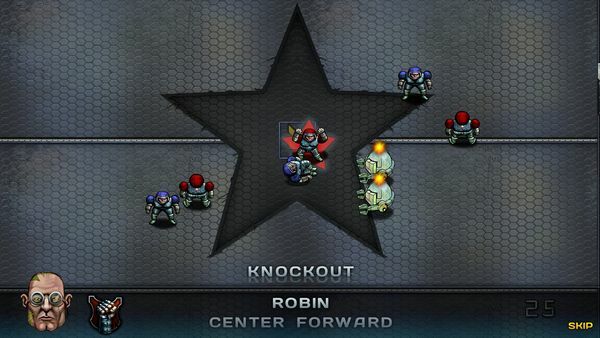 Updating the visuals to high resolution has not added anything – although it hasn’t taken anything away, as the pace of the game means that within a short amount of time you’ll find yourself desperately trying to clear play from your goalmouth rather than considering the aesthetics. Perhaps the single biggest issue the game has, the one single biggest indicator of how much the last two decades have changed gaming, is the multiplayer. There are modes for quick matches, or setting up tournaments… but these are all local multiplayer. There are no online play modes, much as if you had fired up your ST all those years ago. I cannot lie – playing on the same system, in the same room as a friend is always going to have that edge over playing online. But equally, players who remember the game are likely to also be now living a different life now – schoolchildren who could visit each others’ homes in the evening to play will now likely be balancing jobs and a family, and the difference that being able to having quick, three minute games online would have made would have been a huge one. On the other hand, will younger players be tempted by a game that is worth playing, but somehow still shows it age? Giving an overall score to Speedball 2 HD is challenging. The game is as fun and as balanced as it was when the original was released, and if you ever enjoyed that you’ll likely still enjoy it. But the remake adds too little – the main addition being the higher resolution graphics which are a mixed blessing. And the lack of any online mode stands out by its absence, which is a pity for a game which has plenty of nuances to learn and use. The score of 7 is mostly for the underlying game, which has stood the test of time well. Speedball 2 HD is available via Steam, Get Games and GoG; for the first week of release (5th to 12th December, 2013) it is available for 20% off.